This is the fifty-fifth lesson in author and pastor Mel Lawrenz’ How to Live the Bible series. If you know someone or a group who would like to follow along on this journey through Scripture, they can get more info and sign up to receive these essays via email here. A few days ago I stood at the base of the Egyptian pyramids on the outskirts of Cairo, as I have before. And again, it took real mental concentration to comprehend the meaning of this place. When Moses grew up in Egypt the pyramids were already 1,000 years old. I stretched out my hand to touch the stones, wondering whether Moses did the same. We can talk about “living the Bible” because the writers of Scripture did themselves live it. We have truth from God, not as an abstract philosophy, but as revelations that came from God through people trying to live well. We sometimes talk about “the land of the Bible” forgetting that the Promised Land into which the 12 tribes of Israel moved under Joshua’s leadership is only part of “the land of the Bible.” The great drama of God Almighty with the human race takes place across a vast landscape—from Egypt in the West, through the narrow strip of land that became Israel, and out to the East in Mesopotamia which was the setting of one empire after another. When he was a wandering nomad, Abraham and his family went to live in Egypt to escape famine. His great-grandson, Joseph, after being betrayed by his brothers, ended up in Egypt and ascended to rule at the right hand of the ruler of the Egyptian empire, Pharaoh. Many generations later the tribe of Abraham living in Egypt had multiplied into hundreds of thousands, but lived in cruel slavery. God called Moses to confront the Pharaoh of the time and to lead the Hebrews out of Egypt. For the centuries the Hebrews inhabited the land of promise, establishing Israel, there were always tensions with Egypt. God had given his people a land poised between two superpowers: Egypt in the West and the successive empires of the East. Not a comfortable place to live. About 2,000 years after Abraham fled to Egypt to escape famine, a man named Joseph and his wife Mary took their newborn son to Egypt in order to escape an evil king named Herod who wanted to find and kill their son. Jesus and his parents found refuge there, until an angel told Joseph that Herod had died, and it was safe to return home. At other times Jews fled to Egypt as a place of refuge where they set up colonies. By the time of the New Testament a vibrant Jewish population was settled in Alexandria, for instance. Last week I was teaching Christian church leaders in Alexandria. Christians are a minority in Egypt today, but they live their faith with the knowledge that God has been at work in Egypt for thousands of years. The gospel of Jesus Christ asserts that God is reclaiming the whole world for his purposes. God told Abraham that, through his tribe, all the nations of the earth would be blessed. So the name of Jesus Christ is proclaimed in every corner of Africa and Asia and the Americas and every other part of the world. 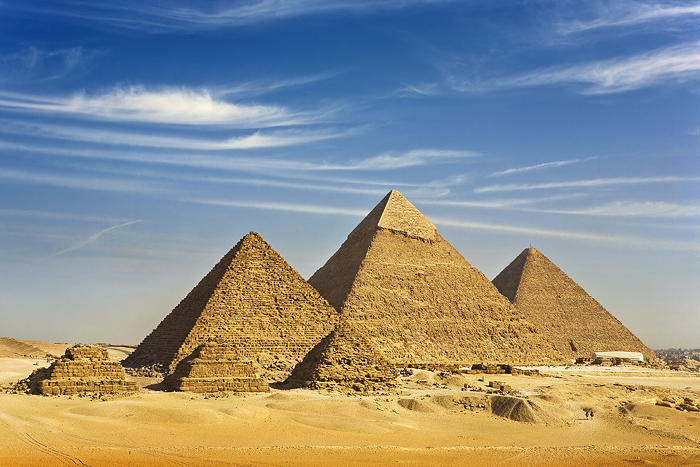 Of the seven wonders of the ancient world, only one exists today: the pyramids of Giza. The largest of them rises almost 500 feet above ground, constructed from over two million stones, each weighing tons. For almost 4,000 years, it was the tallest structure in the world. They are tombs. Built for an elite few like Pharaohs, the pyramids of Egypt may have been built to provide the carefully preserved corpse inside a supernatural passageway into the afterlife. Deep inside, their chambers held chariots and weapons and gold and even bread. Most of the tombs of these kings were plundered over the ages. These dramatic places make me think about the contrast with eternal hope in Jesus Christ. His body was laid in a borrowed tomb. And on the third day the tomb was evacuated. It wasn’t grave robbers who emptied Jesus’ tomb, but the resurrection power of God. A pyramid in Egypt was designed as a kind of resurrection machine for just one person. In the gospel of Jesus Christ there is hope for any and all who believe—and it doesn’t matter how much you spend on your grave. Last week I walked into the King Tut section of the Egyptian museum and stood inches away from the iconic gold mask of the young king. The engraving and painting and jewels and the solid gold itself are breathtaking. But then I looked at a young man standing next to me who was peering at this same piece of history. I thought how the mask of King Tut is just cold, dead metal, but this man standing next to me was living flesh, made in the image of God. Egypt reminds us of our ancient history as the human race, and of our universal longings. We know life in this world is brief, and that each of us contributes just to a blip in the long history of the world. In Jesus we have not a Pharaoh, but a mighty King who has authority over heaven and earth. It doesn’t take moving two million boulders to have a relationship with the Creator, just the faith of a child.